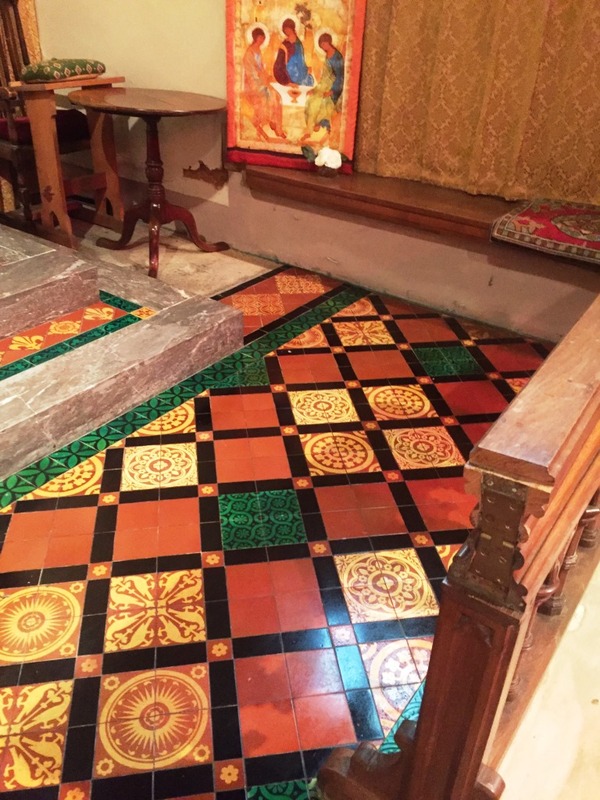 You can see from the photograph above that the tiles were discoloured with years upon years of ingrained dirt but what you can’t see is the adhesive that was used to secure the carpet to the tile. 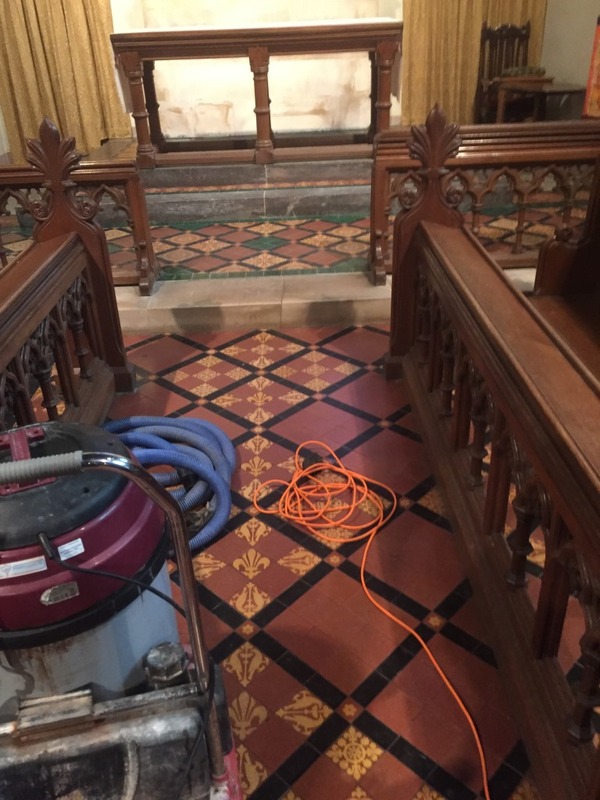 The whole floor and the Altar behind would need several deep cleans to remove the dirt and glue and being a busy church with an active congregation I it would need to be done in a few days. 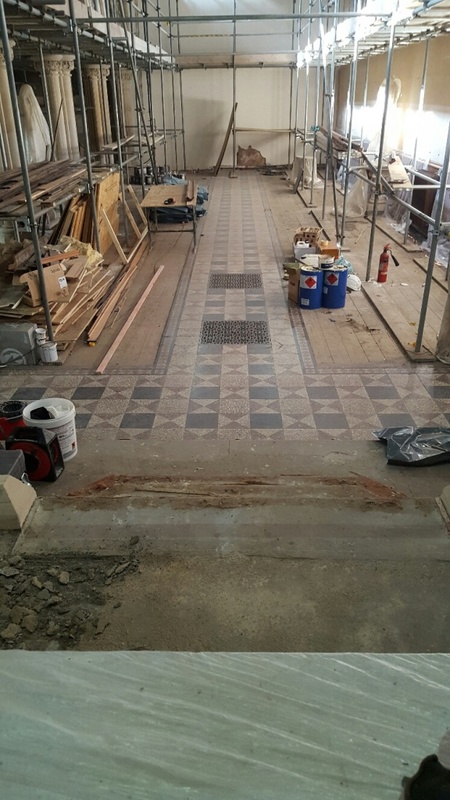 In need of an extra pair of hands I gave Derbyshire Tile Doctor Henri Mall a call and he was more than happy to help me out. 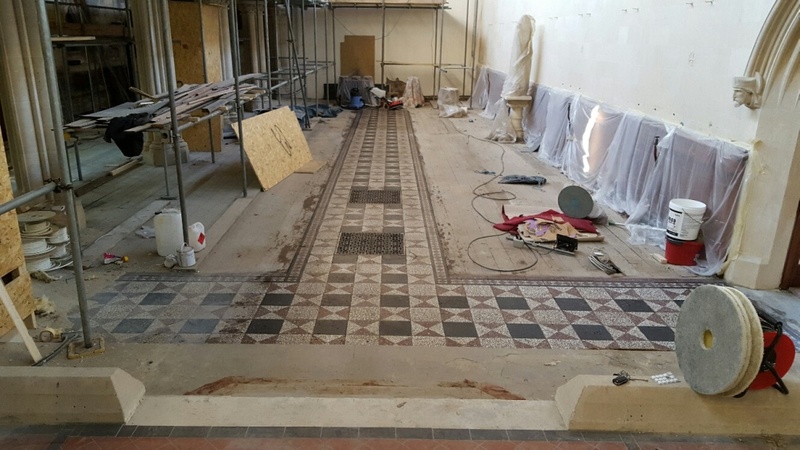 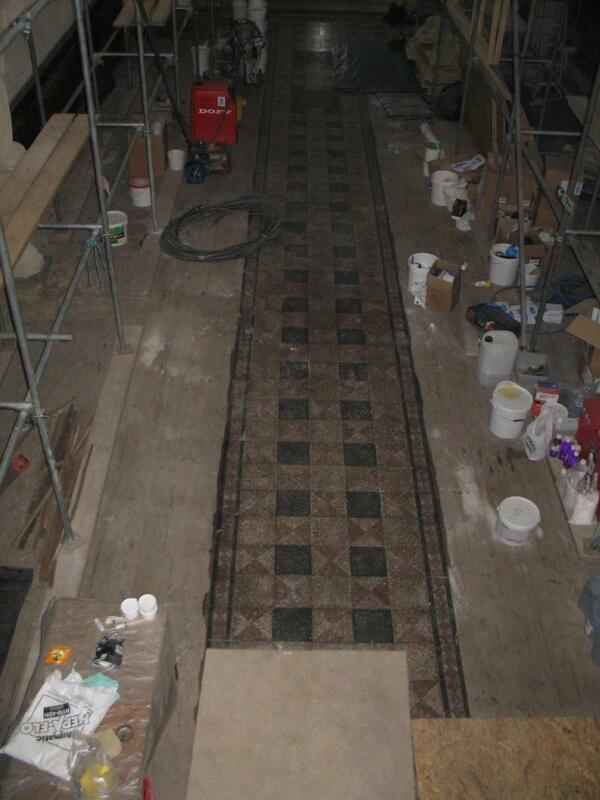 Back in June, I had the absolute pleasure of undertaking a large scale tiled floor restoration at St. Mary’s Church in Bath. 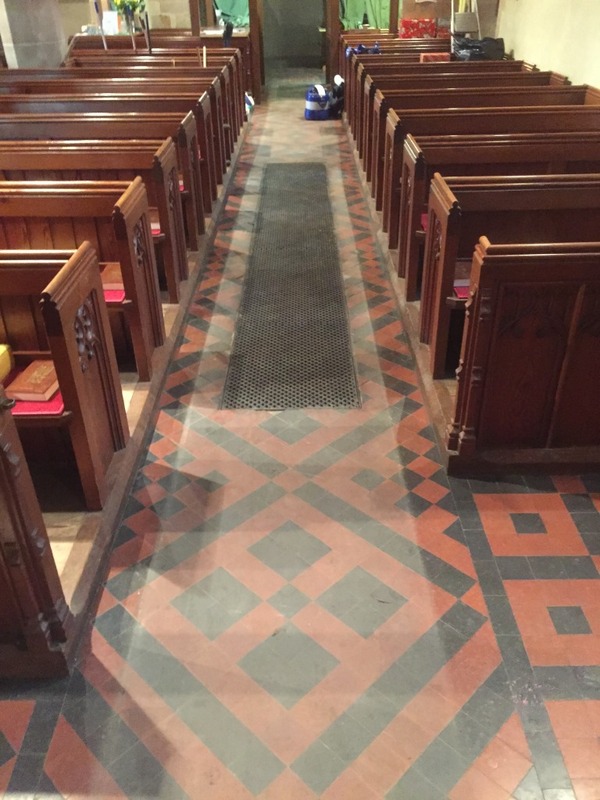 An architect who does a lot of commissions in Bath and the surrounding areas got in touch with me as they needed to restore the very weathered and worn Church flooring, which dates back to 1840. 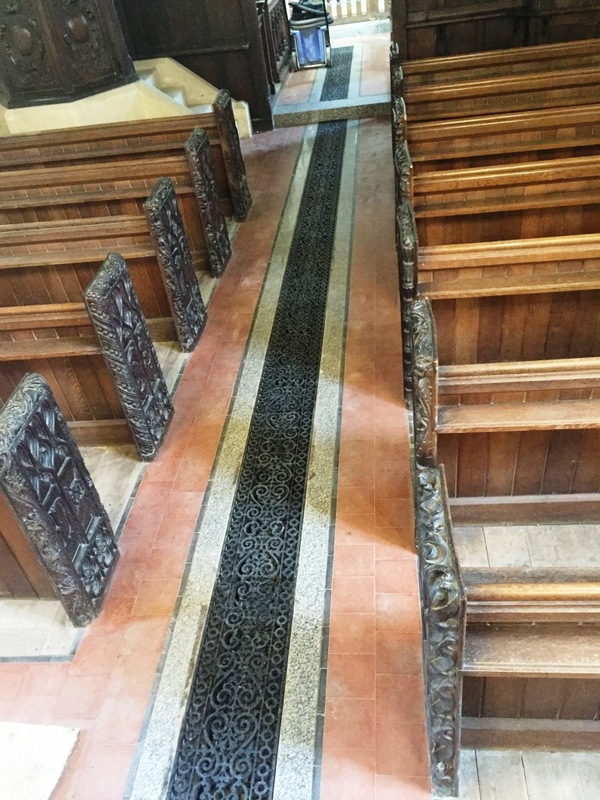 The Church itself had suffered a lot from fire damage and the Terrazzo flooring had lost any shine due to both exposure to the smoke and, of course, a lot of wear and tear over the course of 176 years. 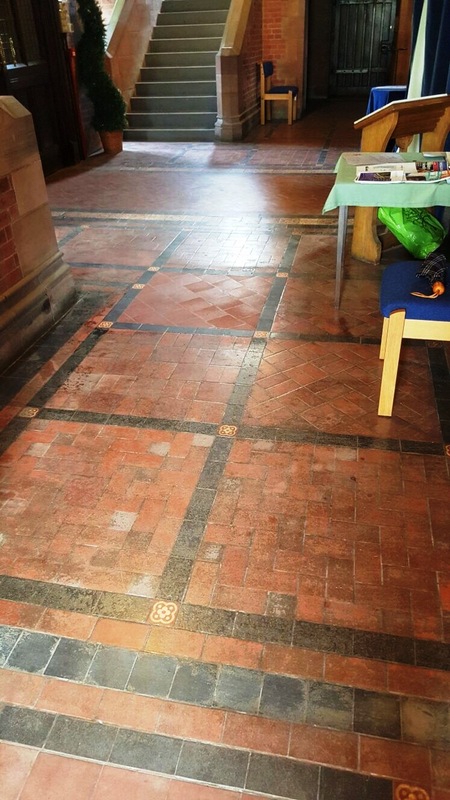 There were also a number of missing tiles that needed to be replaced. 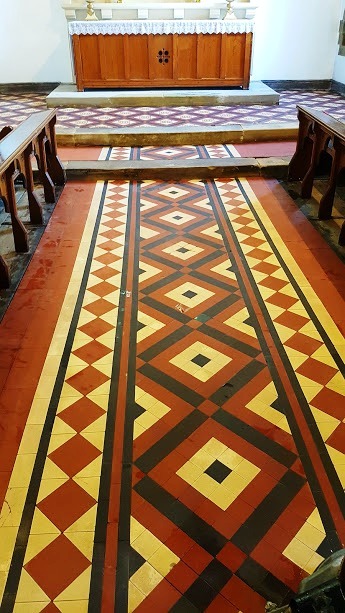 In addition, some old carpet which was beyond repair had been pulled up to reveal some fantastic red Quarry tiles that the architect hoped could also be restored. 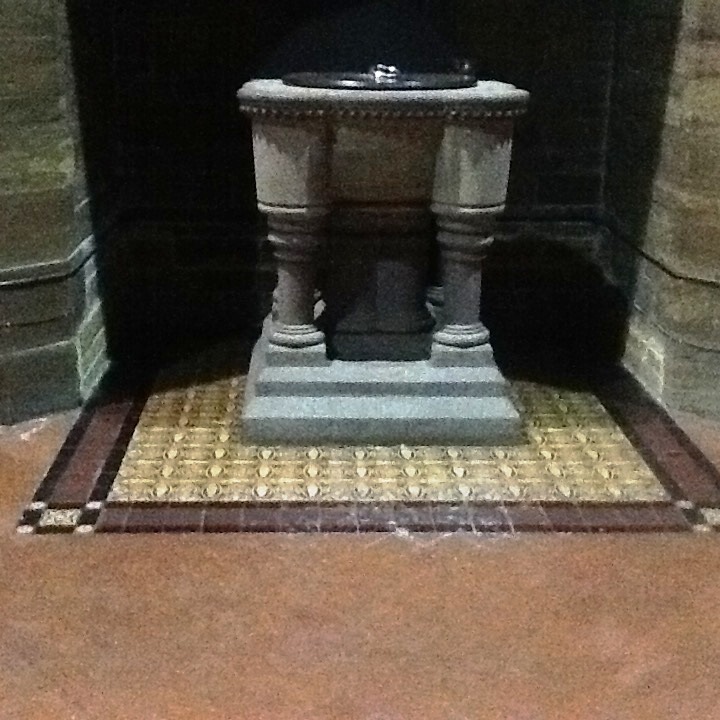 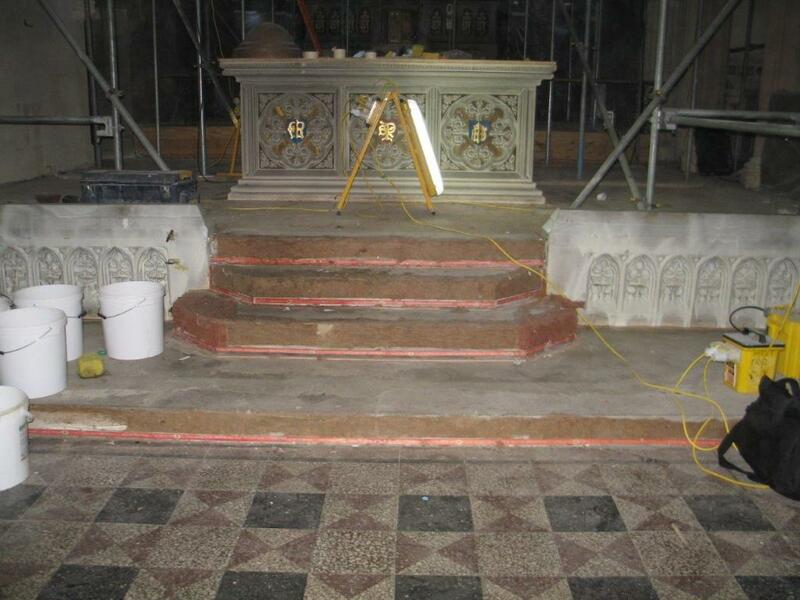 They had discovered that some of the tiles had been removed in front of the Altar (an area of around 2.5 square metres) and cemented over due to the Altar being moved back a metre. 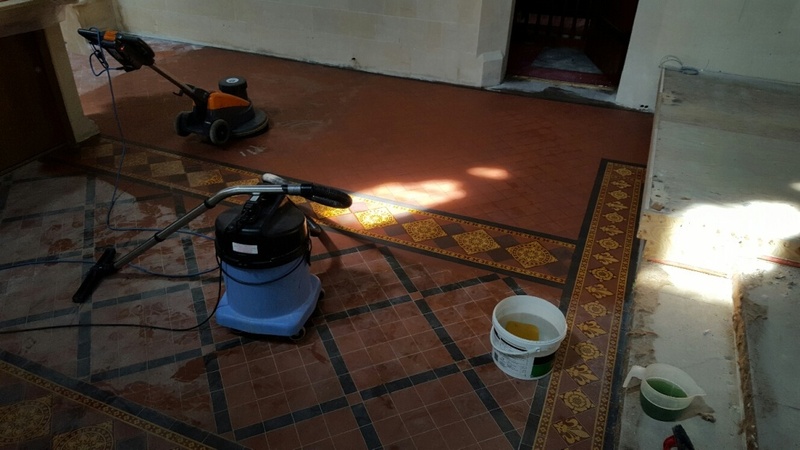 Fully restoring both large areas of tiled flooring would take time however with numerous contractors and trades also working in the building at the same time I completed the work in stages over a period of two months. 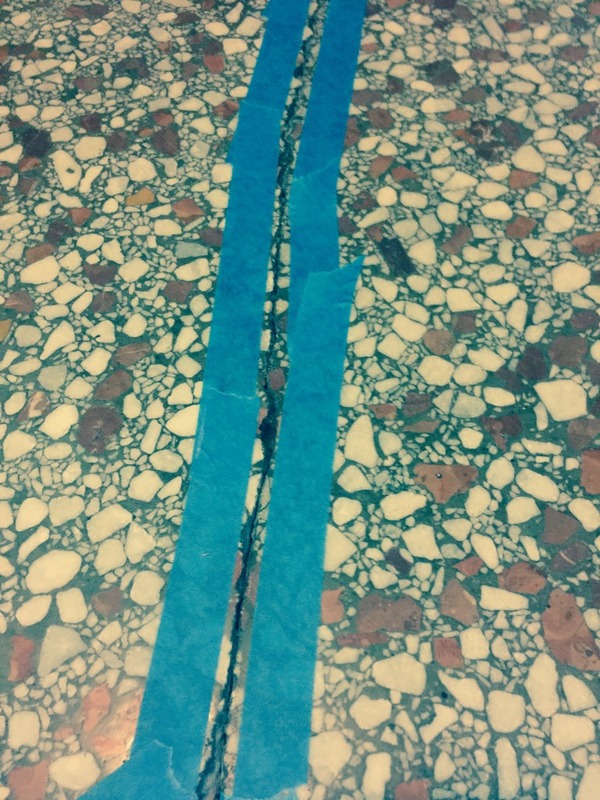 To begin, I took moisture readings over all areas due to be worked on. 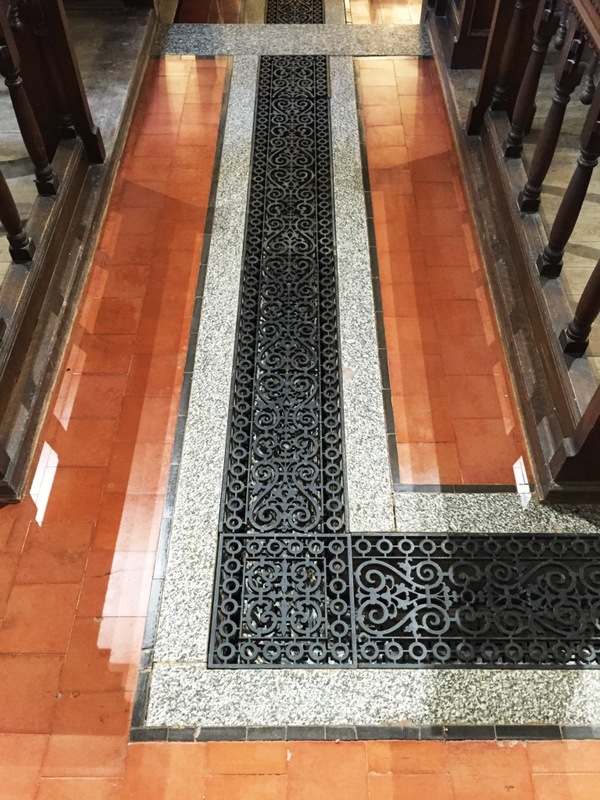 In some places, the levels of moisture were high for two reasons: first, a significant amount of water had been used to quell the fire, and second the red Quarry tiles had been laid with no damp proof membrane due to the age of the building. 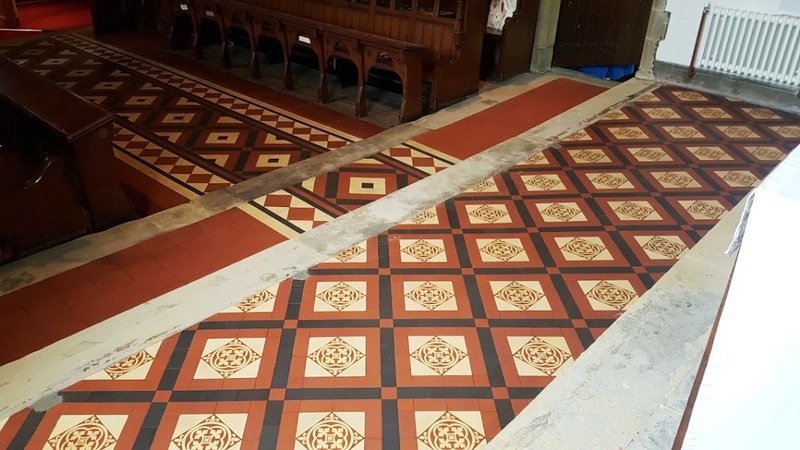 Next, I liaised with the architect to decide what tile and pattern would be best to replace the cement area in order to compliment the surrounding red tiles. 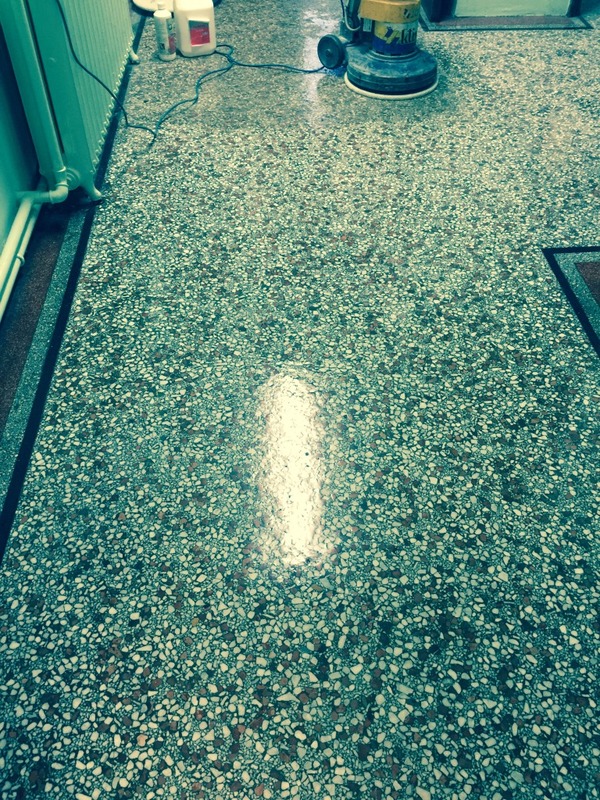 We decided on a similar shape and colour from original style. 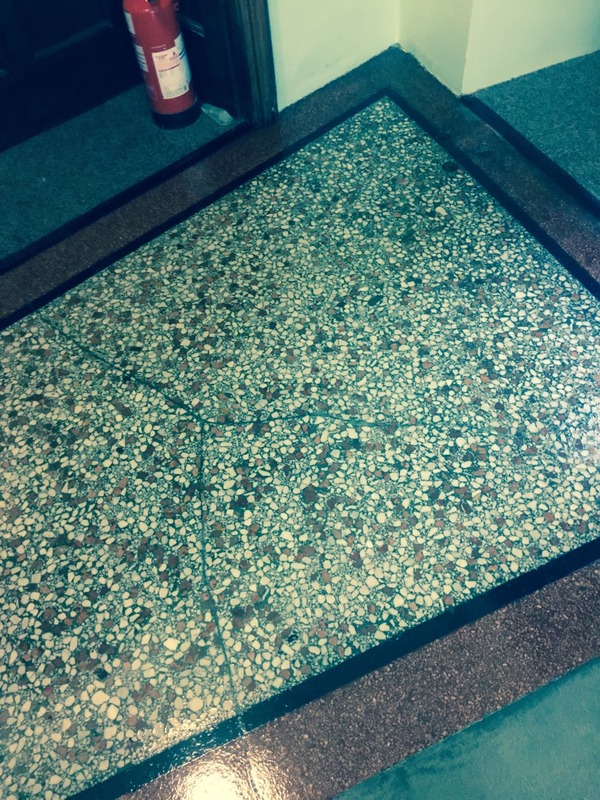 I then removed the cement, re-cemented and tiled the area accordingly. 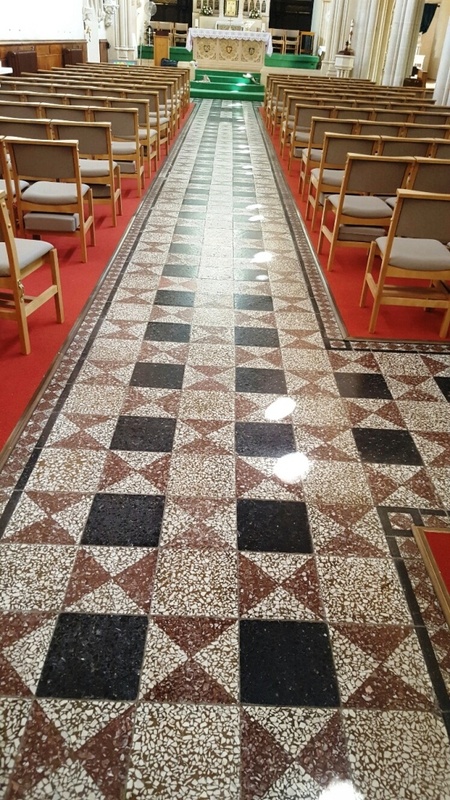 Following this, I removed the badly damaged Terrazzo tiles and replaced them with spare replica tiles that the architect had leftover from previous projects. 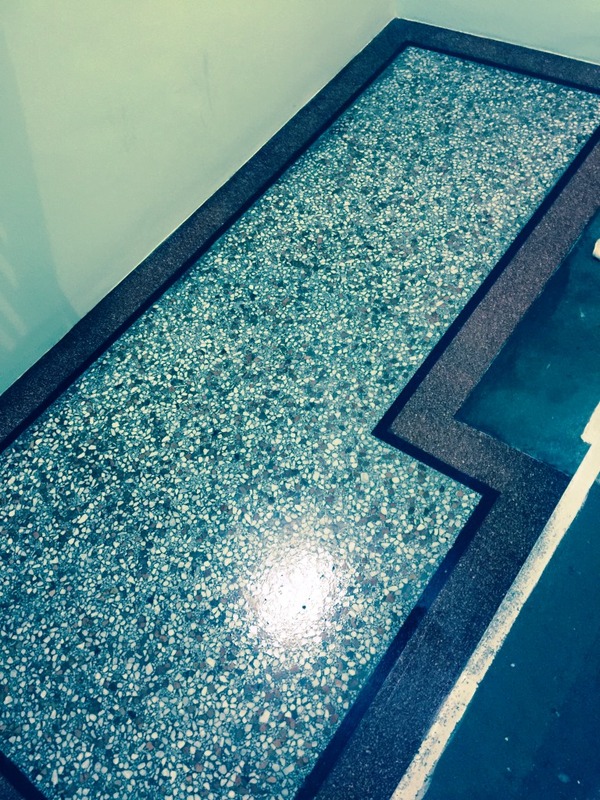 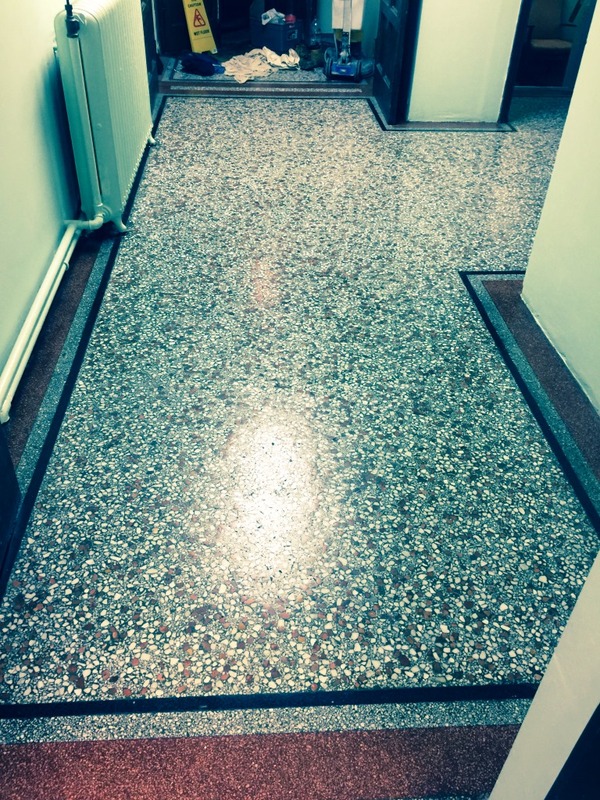 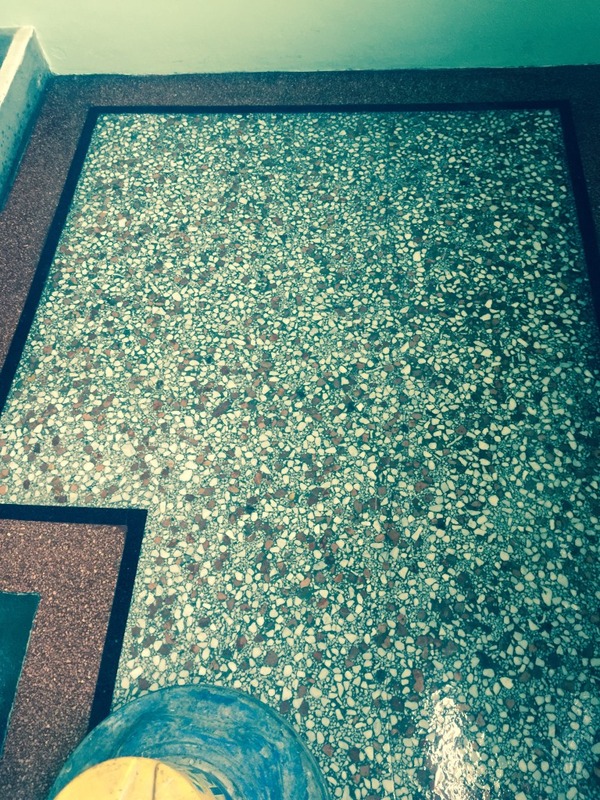 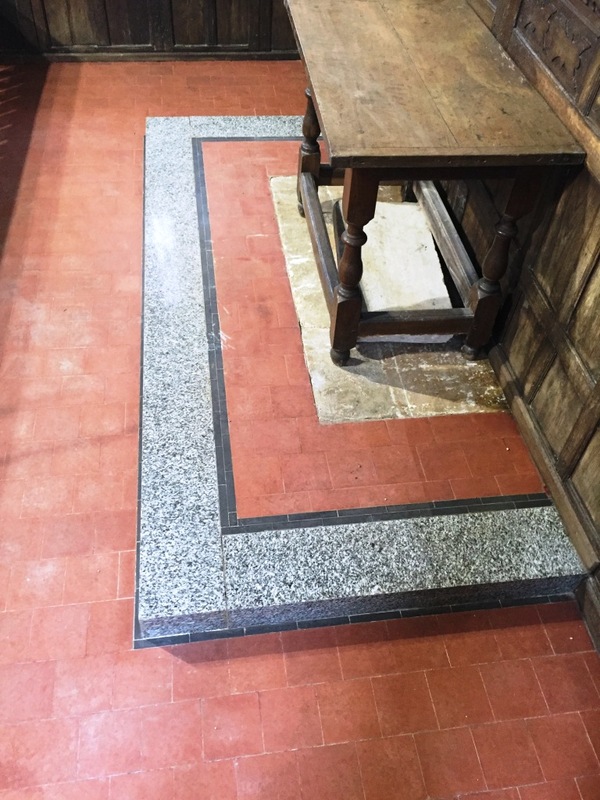 My method for restoring the Terrazzo tiles was to use the Tile Doctor four pad burnishing system, applying each diamond encrusted pad in turn – from Coarse to Very Fine – to clean and polish the stone. 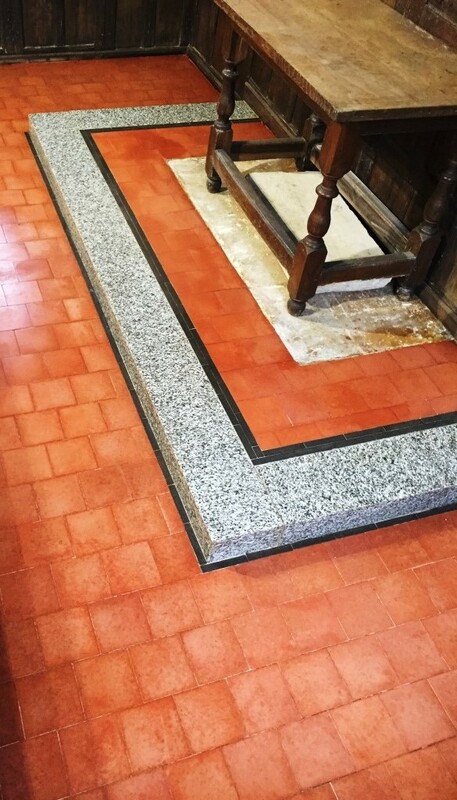 I then sealed the tiles with an impregnating sealer known as Tile Doctor Colour Grow which enhances the natural colours in the stone. 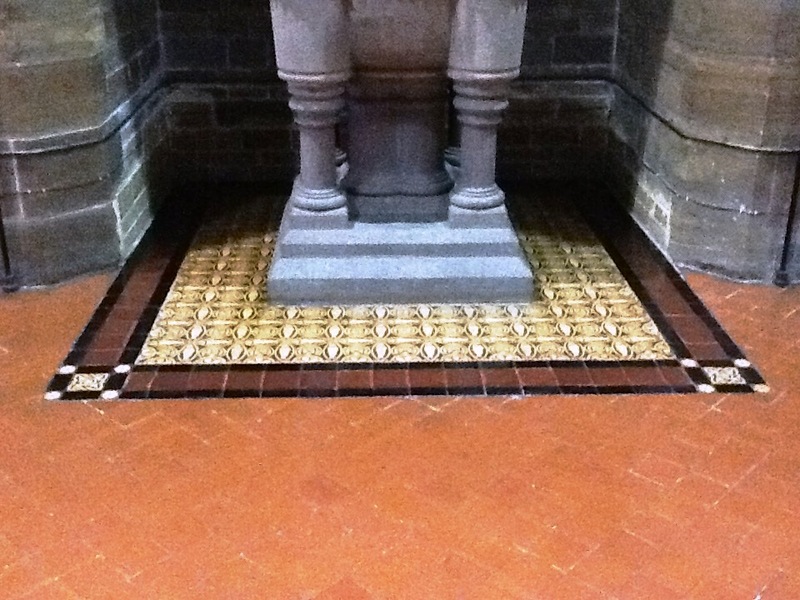 Finally, I went over the tiles again with the Very Fine burnishing pad to refine the shine. 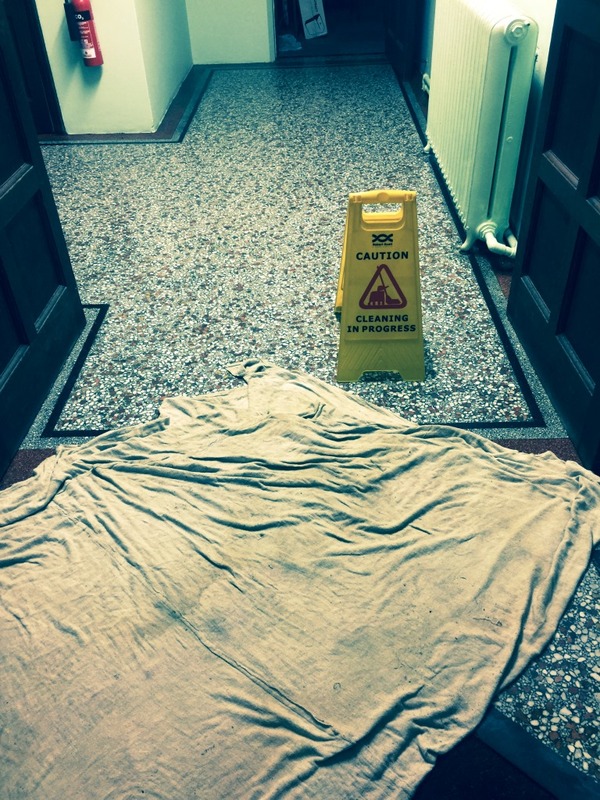 Needless to say, I checked for moisture before sealing, and thankfully the floor proved dry. 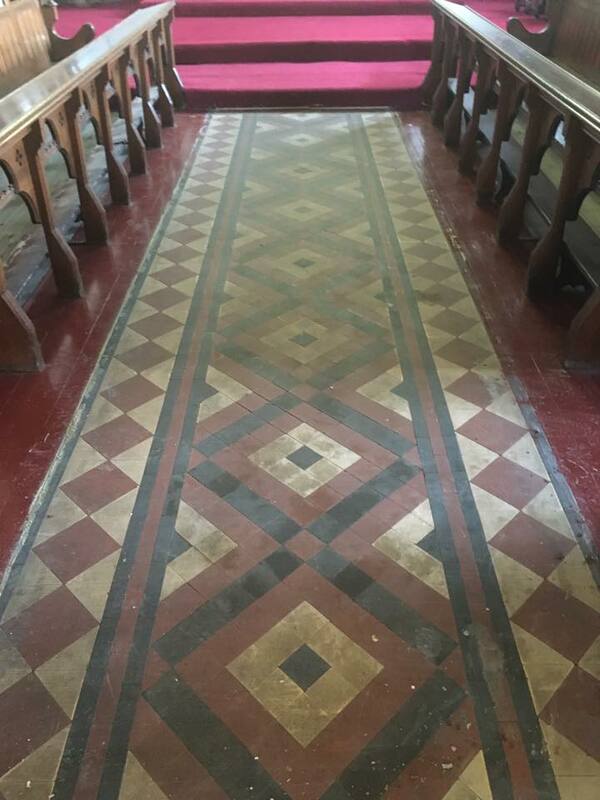 In some areas, the red Quarry tiles had glue on them from the carpet being stuck down for many years. 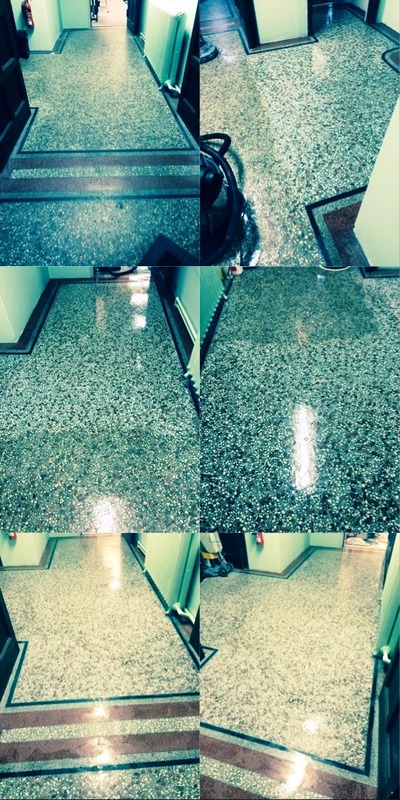 I manually scraped off the large, tough glue residues, and once this had been done, I used Tile Doctor Remove and Go combined with Tile Doctor Pro Clean to soften and break down any particularly stubborn glue deposits. 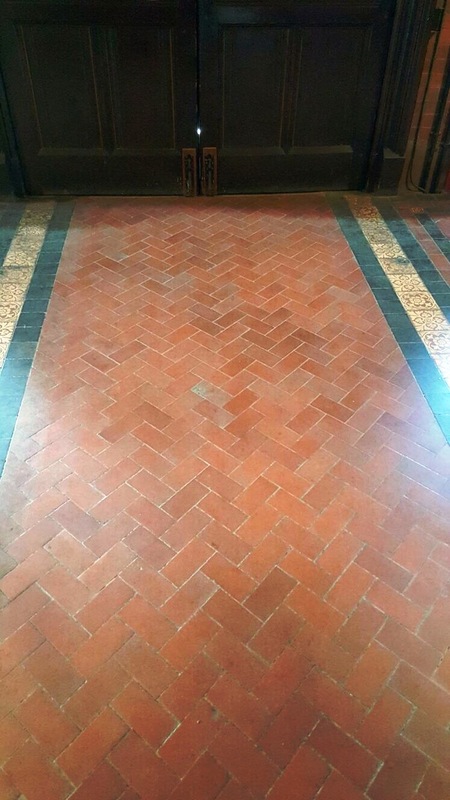 After rinsing the floor, I went over it again with the Coarse grit burnishing pad to give the surface a really good clean. 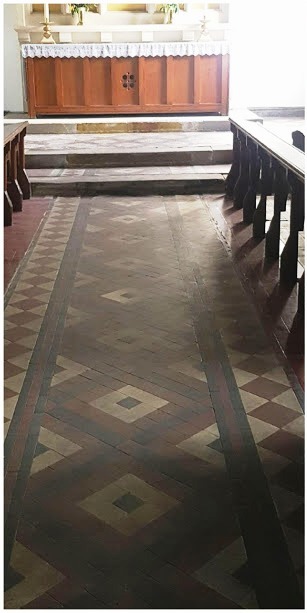 The remaining Quarry tiles were cleaned by using the same Coarse grit pad. 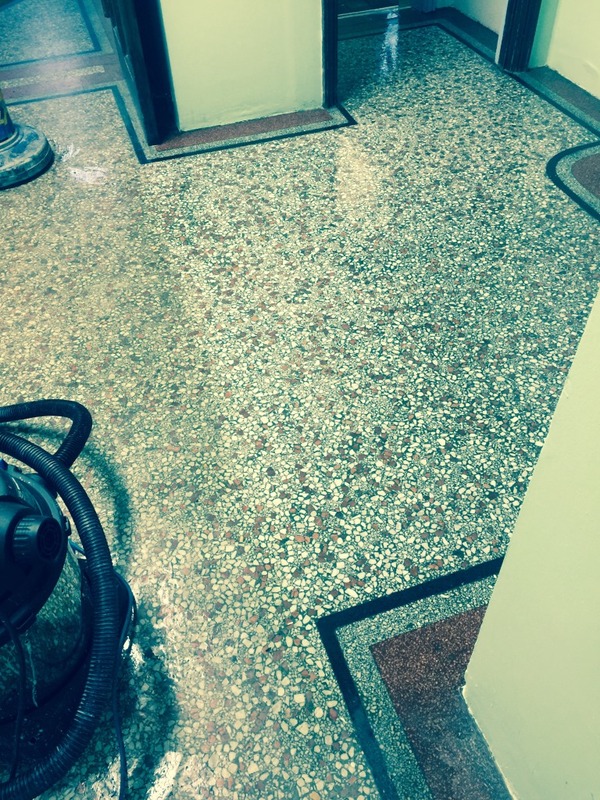 using water to lubricate the process and rinsing periodically as I worked. 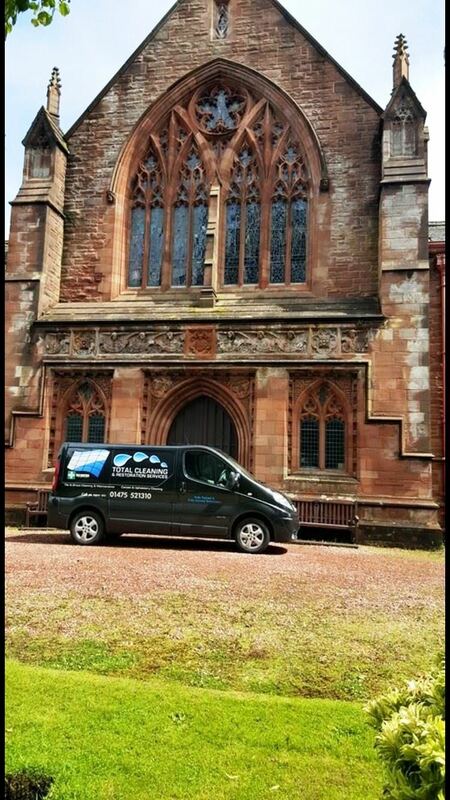 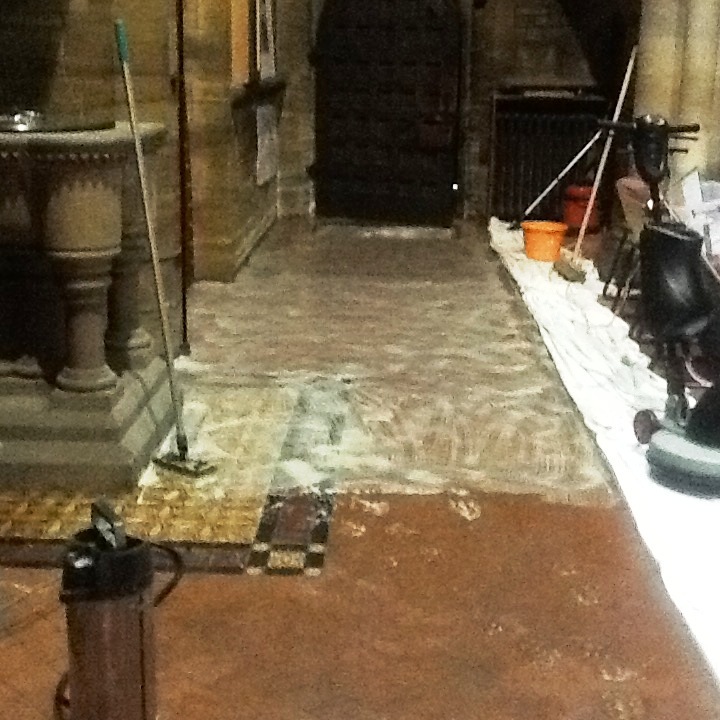 Having cleaned the tiles, I left the Church for a week to allow the builders and other trades to finish their work. 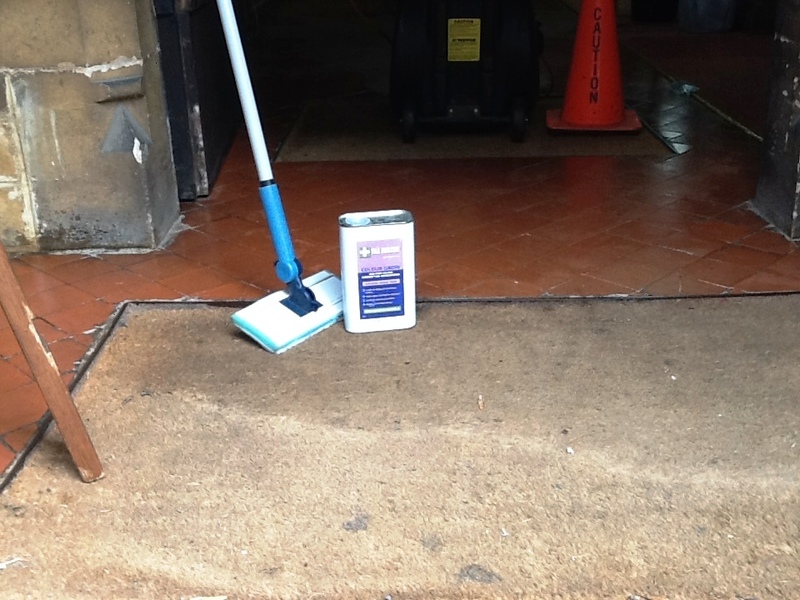 Upon my return, I ran some damp tests to and found the readings were sky high, meaning sealing was not an option at this time. 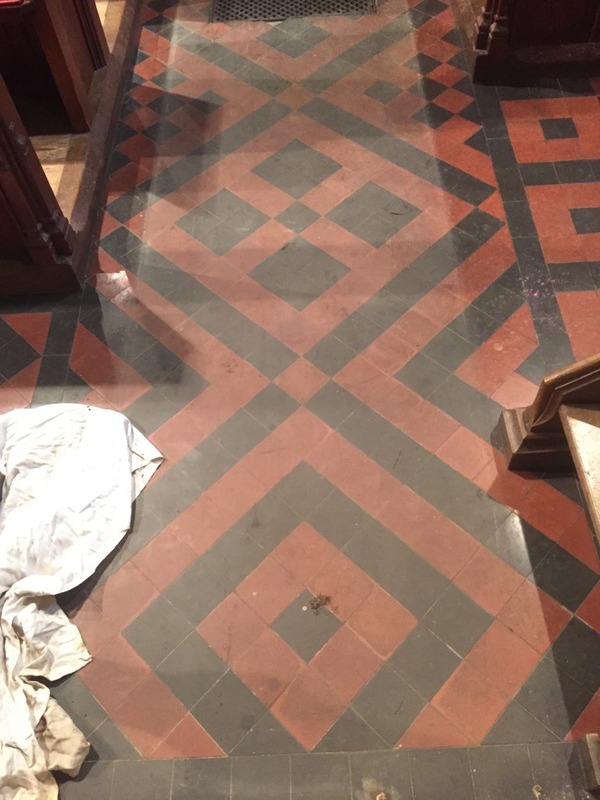 I discussed this issue with the architect and we decided to carry on with the completion in a month, leaving the floor enough time to dry out and for any other building work to be completed. 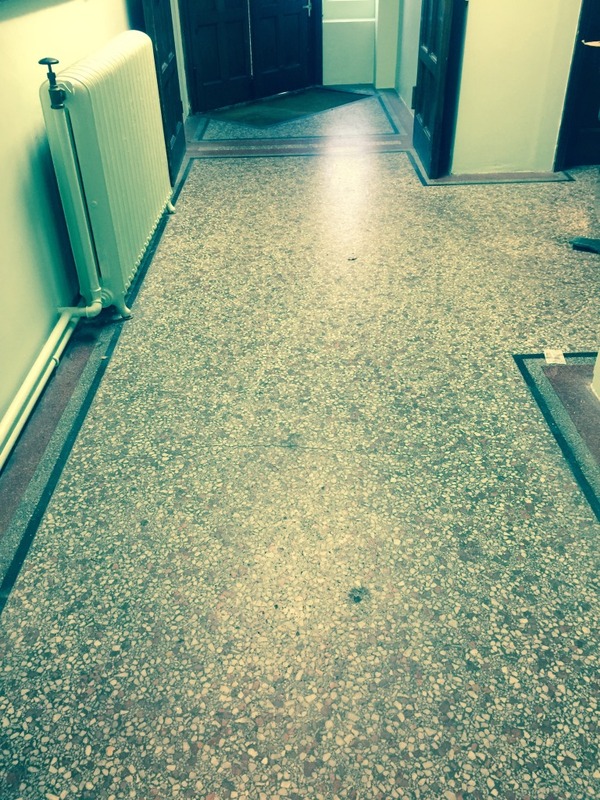 By that time, the heating system would have also been installed and would work to help the floor to dry out quicker. 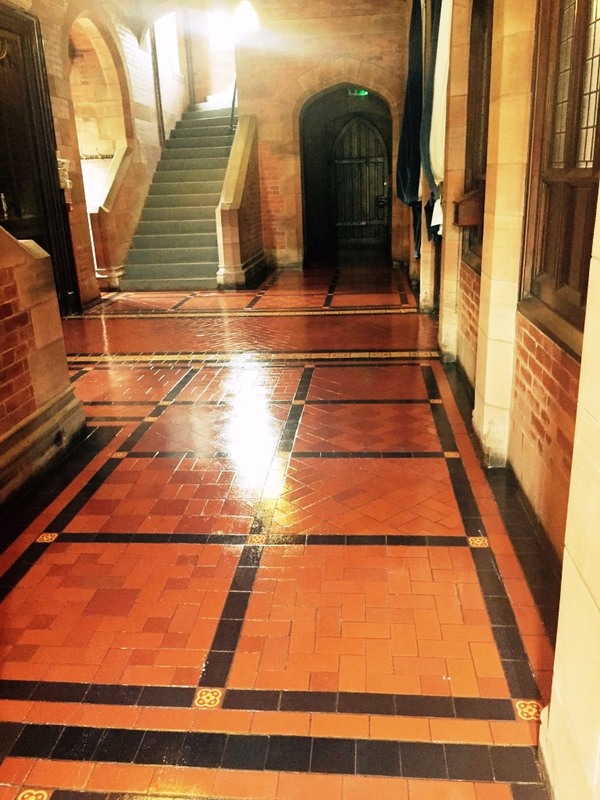 A month passed, and I returned to seal the Quarry tiles. 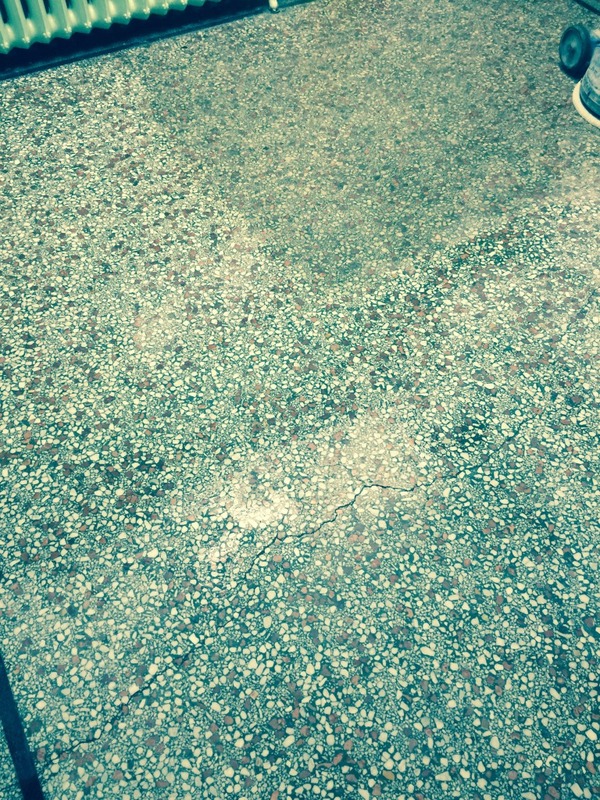 However, before doing so I noticed efflorescence in some areas and neutralised it using Tile Doctor Acid Gel. 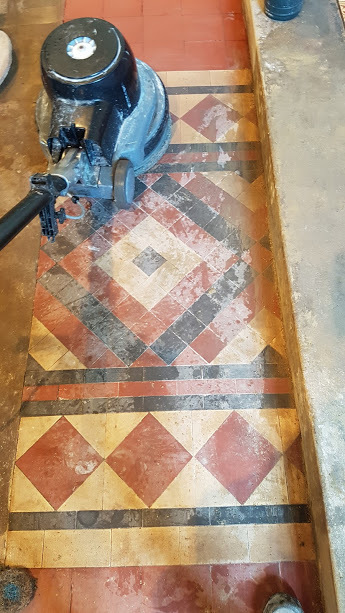 I then left the floor a further two days to dry, by which time the Acid Gel had successfully removed all traces of efflorescence. 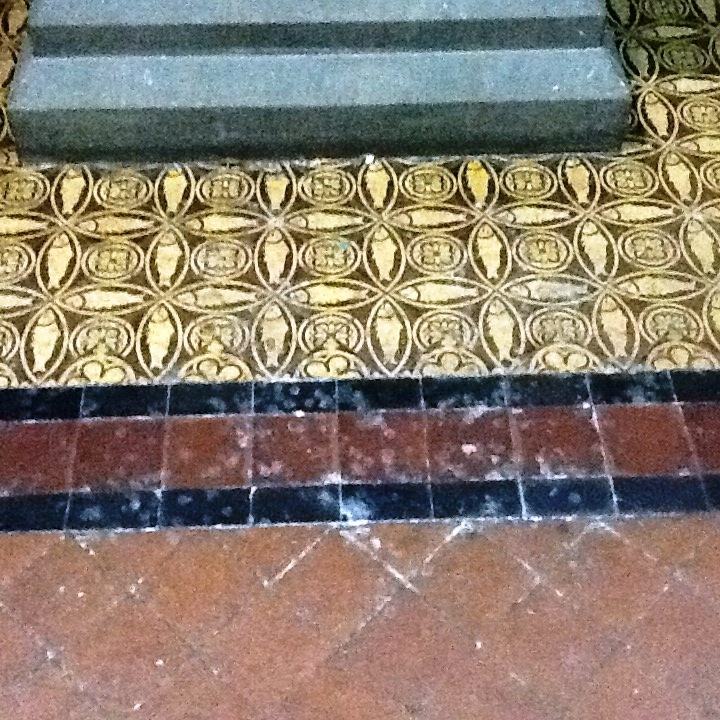 To my satisfaction, the moisture readings I took upon my return were low, meaning the tiles were ready to be sealed. 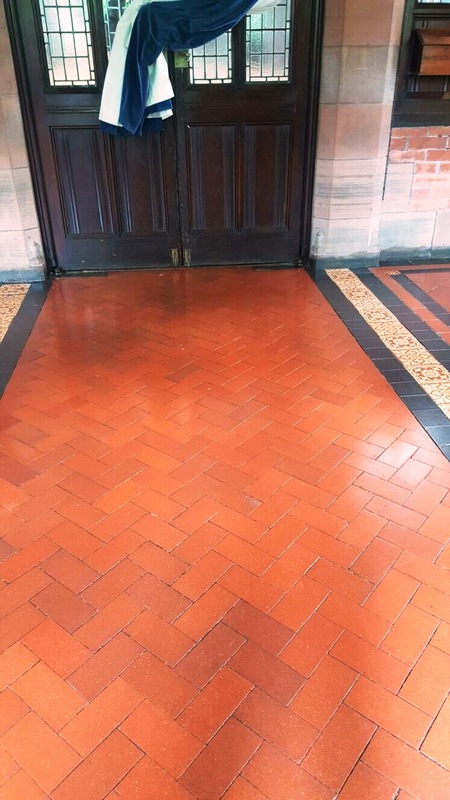 To seal the tiles, I applied several costs of Tile Doctor Colour Grow, an impregnating sealer which helps protects with no damp proof membrane, follows by a few coats of Tile Doctor Seal and Go, a sealer which prices a nice satin shine finish. 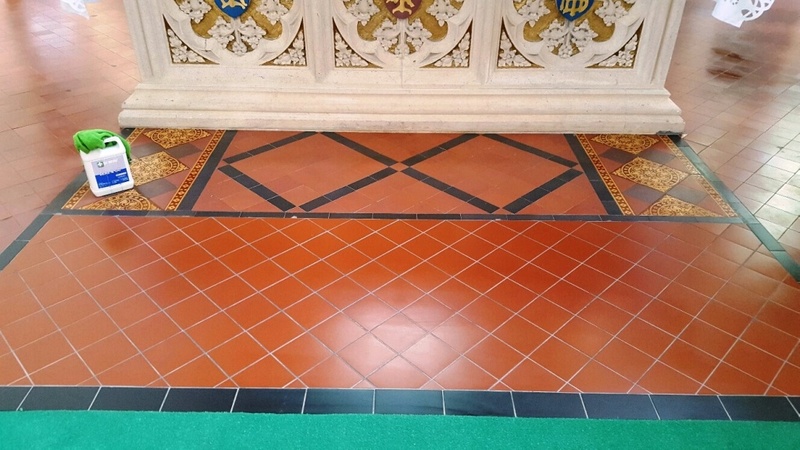 This really enhanced the old fire red pigment in the tiles. 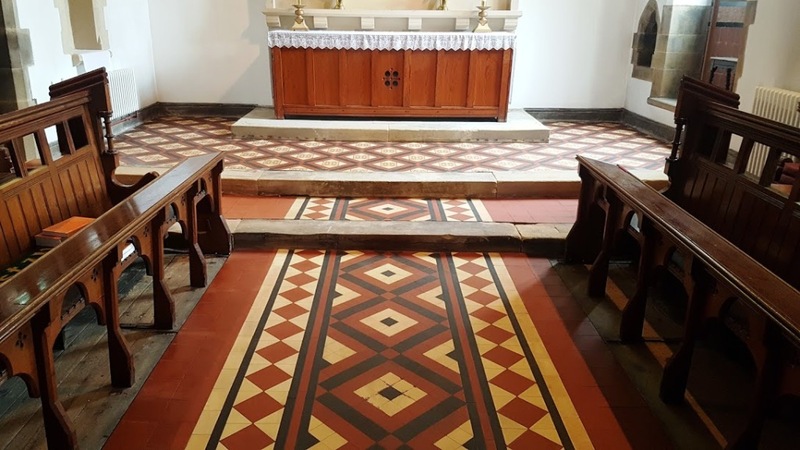 While it was a long and difficult process to fully restore both sets of tiles, the outcome was very much worth the wait. 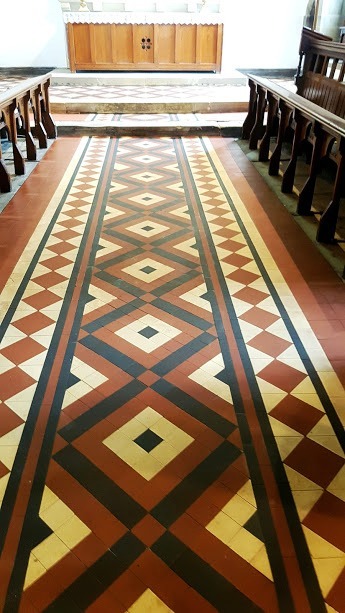 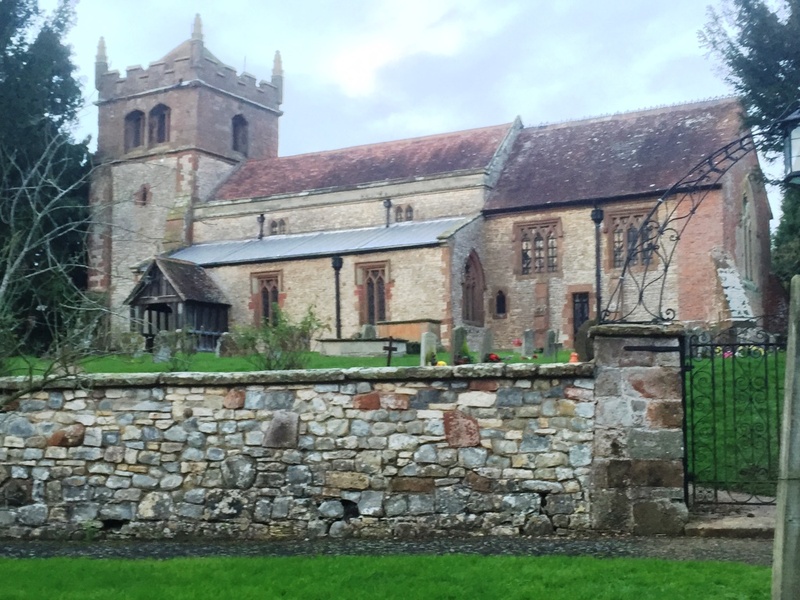 Looking at the before and after photographs, it’s easy to see why the architect, priest and the parishioners were absolutely delighted with the results. 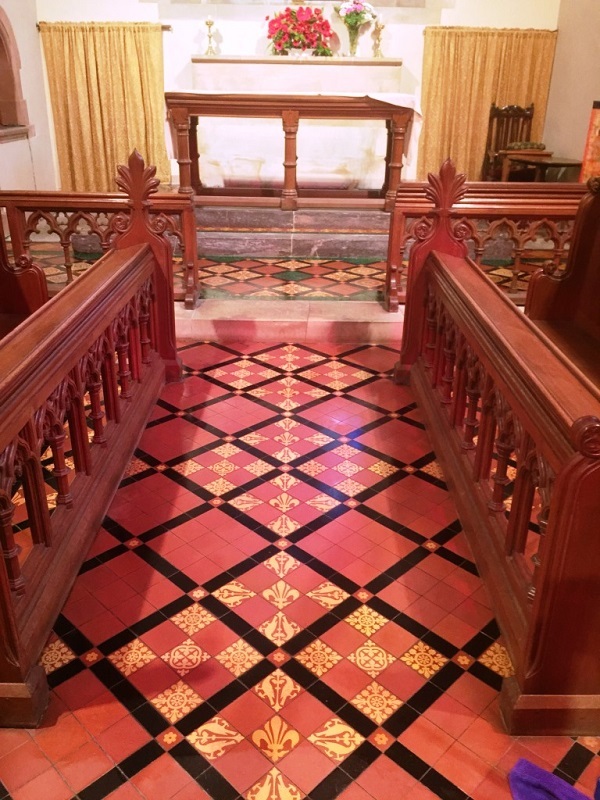 I’m also really pleased to have contributed to the restoration and continued conservation of this wonderful building.